A guided small group adventure camping safari 3 day tour commences in Alice Springs and finishes at Ayers Rock Resort. Our original Wayoutback Safari, offering an authentic outback adventure with a touch of style and quality. Travel with a small group in a purpose built four - wheel drive vehicle. As well as experiencing the wonders of Uluru (Ayers Rock), Kata Tju t a (The Olgas) and Watarrka (Kings Canyon), we'll give you the opportunity to really experience the desert - driving on dirt roads, avoiding the crowds and sleeping at our remote private bush camps. Participate in an indigenous cultural exchange at Uluru including an Aboriginal Guid ed walk followed by a dot painting workshop. Choose to sleep under the clearest southern stars you can imagine with your choice of a traditional swag or comfortable permanent safari tent complete with beds, pillows and all linen. Enjoy our Endless star din ing at Uluru, with quality food cooked over the campfire. T his is an emotive journey into the heart of the Red Centre. • * Book this Safari in conjunction with a 3, 4 or 5 day Top End Open Aged Safari and receive $50 per p erson per tour discount. • * Book this Safari travelling in a group of f our o r more and receive 5% discount of f the RRP price per person. • * Multi Tour discount or F amily and Fr iends Four or more d iscounts not available in conjunction with each other. Departing Alice Springs bright and early , we hit the road on our adventure of a lifetime (For tho se commencing the tour at Uluru, we will collect you from the Outback Pioneer Hotel or the airport). Ou r journey begins heading south through the Waterhouse and James Ranges with a stop at the Camel Farm for a Camel ride if you're keen (own expense). We stop at Mount Ebenezer Roadhouse where you can view or purchase Aboriginal artefacts. Stop to view Atila (Mount Connor), a mesa tablelan d and the first significant rock formation of our trip. After a stop for lunch and our arrival at the Uluru - Kata Tju t a National Park, we travel to the base of Uluru where your guide will lead you on an interpretive walk, hearing of the Aboriginal law and religion (Tjukurpa) . Continuing on, we meet our local Aboriginal Guide who will provide a once in a lifetime authentic Indigenous cultural experience with an interpretive walk to Mutitjulu Waterhole where you will hear the stories of the unique landscapes, art and culture of the local custodians, the Anangu people. This experience is followed by a hands - on dot painting session where you will take your artwork as a memento of your experience. We conclude at the Cultural Centre, where you may explore the di splays and learn of the flora and fauna of this unique area. 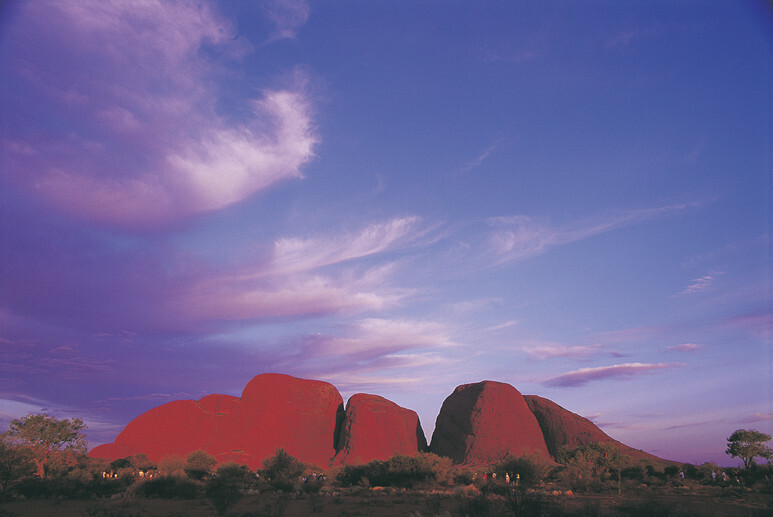 Experience the famous changing colours of Uluru at sunset, away from the crowds, complete with sparkling wine and nibbles. It's a great time to kick back and contemplate the day and the vastness of the desert. Afterwards settle in at our remote private camp, complete with our signature Endless Star dining experience before retiring to your swag under the amazing night sky or your comfortable safari tent complete with beds. Rising early, take a short walk to a lookout close to our campsite to view sunrise over Uluru and Kata Tjuta without the hustle and bustle of the public viewing areas before heading off to Kata Tju t a for a walk through the "Valley of the Winds". Afterwards, we're off to Kings Creek Cattle Sta tion for our second nights' private bush camp, complete with bush toilet a nd shower. With nobody else for miles, this camp has stunning views out over the George Gill Ranges and gives you a real feel for the outback. Dinner around the campfire makes for a very social time with another night out under the stars. Tonight, listen for the sound of dingoes howling in the distance while watching the desert sky light up above you. Today we head off to Watarrka (Kings Canyon) for a mind blowing 6km walk through the towering walls, crevices and plateaus of Watarrka . We'll visit the Amphitheatre, Lost City and the tranquil ‘Garden of Eden’. Later we start making our way back to Alice Springs travelling on a typical outback dirt road. We'll drop you back at your accommodation early evening and usually all meet later f or a bit of a night on the town (Alice seems like the big smoke after 3 days in the bush). • Booked and paid E-Ticket, Torch, wide brimmed hat, sunscreen, insect repellent, water bottle (1.5 litres), walking shoes/boots, sleep ing bag (if you prefer to use your own ), toiletries, swim wear, towel, camera, comfortable and casual clothing for 3 days. • Profess ional guide and campsite host, travel in an air - conditioned 4WD vehicle, Aboriginal Guided walk and Dot Painting workshop at Uluru, all meals (as listed on itineraries), camping equipment including permanent tent with beds and mattress or optional swag . All linen including pillow and pillowcase, fitted sheet, sleeping bag hire and towel. Drinking water (please provide your own bottle). • *Clients joining at Ayers Rock airport or resort will do so after lunch and therefore is not included. Please ensure you have had lunch prior to your collection as we will be travelling straight to Uluru - Kata Tjuta National Park to start the afternoon’s sightseeing. • Due to limited space on the vehicle please restrict luggage to one day pack and one soft overnight bag/backpack. Excess luggage should be stored at your Alice Springs accommodation. If commencing at Ayers Rock please ensure you have one day pack and a soft overnight bag/backpack with the items you require for the 3 days packed inside as your large luggage will be stored in the vehicle/trailer and will not be accessible during this time. • Single pricing option offers guest a guaranteed single permanent tent during the Safari. As we do not always travel at capacity, some guests may be given a single tent without supplement on location . No refund is given for those that have paid the single option in these circumstances. Additionally for those that have chosen single pricing and choose to sleep in a swag, no refund is offered for the single pricing paid. Due to limited space on the vehicle please restrict luggage to a day pack and one soft overnight bag/backpack (maximum 10kg). Excess luggage should be stored at your Alice Springs accommodation. If commencing at Ayers Rock please ensure you have a overnight bag/backpack with the items your require for the 3 days packed inside as your large luggage will be stored in the vehicle and not accessible during the safari.